Chunk Competition - win what you share from our website! Simple. It's time for a Chunk Competition. Time for some payback for our loyal Chunk fans so we're running a nice Chunk Competition. We're tee rich on the run up to Christmas so though 'why not' when the idea of a comp was floated in the Head Office. We're going to keep it simple and easy for everyone to enter and there's some very simple T&C's below. Basically we're going to give away FIVE tees to anyone who shares the tees they want from our site - it's just that easy. Let's break it down for you. 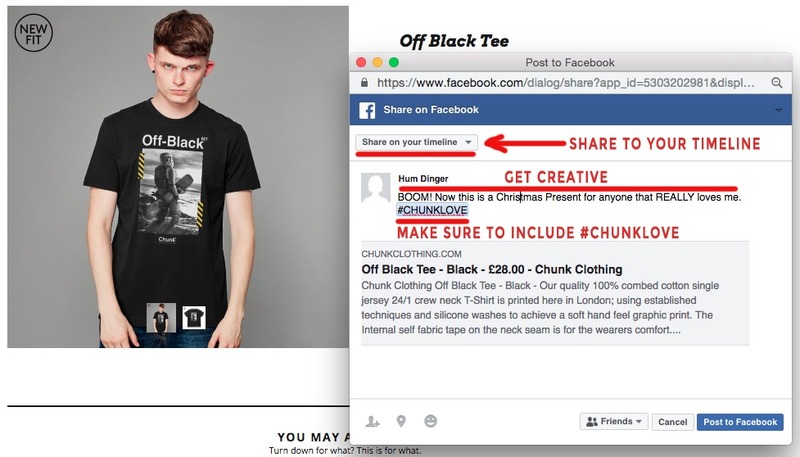 When you share the tee, make sure to include #CHUNKLOVE so we can track your entry. You can enter on Twitter OR Facebook OR both - you decide. On the 20th November at Midnight the competition ends. No shares will be counted after the end. Everyone in? This has to be the easiest competition we have ever run- and anyone can enter. Worldwide baby. Coast to coast, north to south east to west, just share and you're in. Add as many entries as you can and we'll even RT/Share the best comments we have on our social. 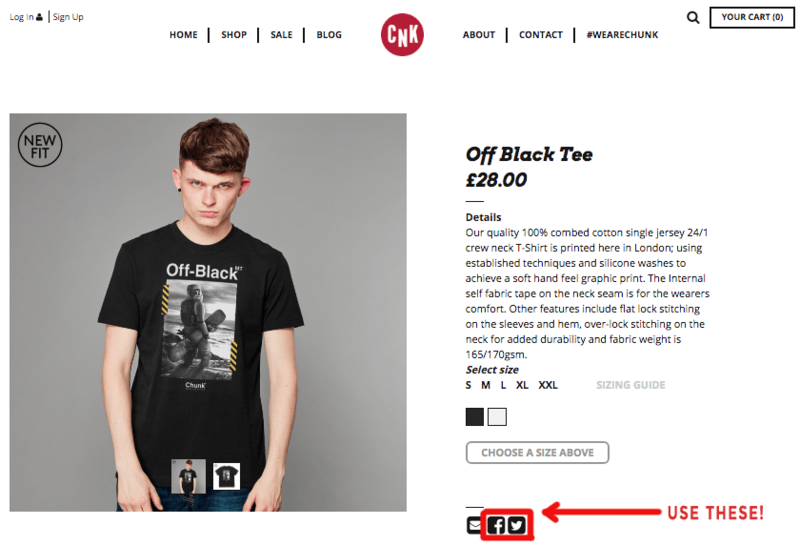 Use the 'Share' buttons on any of the Chunk clothing posts to share what you want to #WIN. When you Share on Twitter make sure to add #CHUNKLOVE in the tweet - bonus points for anything else you add will also be awarded (surprise us)! When you Share on Twitter make sure to add #CHUNKLOVE in the tweet - bonus points for anything else you add will also be awarded (surprise us)! Don;t forget on Facebook to share to your Timeline or we won't see it - also add #CHUNKLOVE so we can search for it - again anything additional you want to add - we'll give bonus points to. 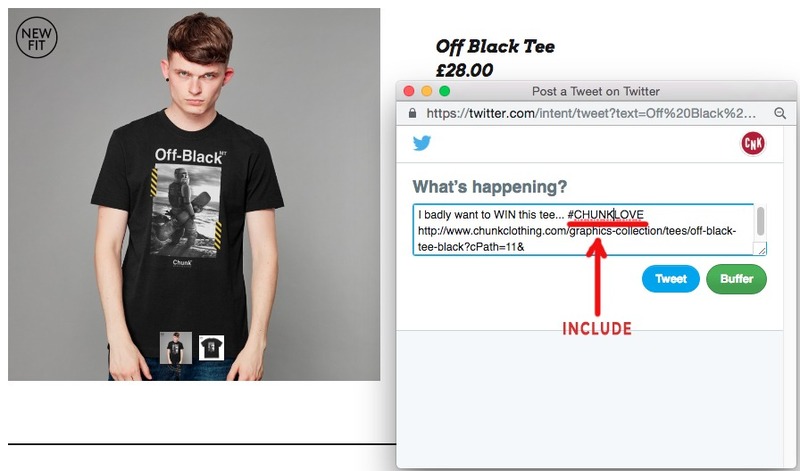 T&C's - simple the competition ends 24:00 GMT on the 20th November. Five winners will win the tee they shared in a size they want, delivered for free. No exchanges, cash alternatives or additional swaps available. We will contact the winners through social and it's up to them to get back to us within 48 hours of us requesting their details to give the prize, or we will have to cancel the offer and give to another winner. You can enter as many times as you want on Facebook or Twitter, or both. If we don't have your size available - we will allow you to change your option for the prize. No returns on competition prizes.